So from my last post I replaced and updated the engine oil feed line on a N20,,,,,the new oil line had a built in check valve,,,well after I was done,,,the next day we started the car up and it was still smoking from the exhaust,,,,I guess BMW fix didn’t work this time,,,,you see inside the turbo exhaust housing the two wet oil spot,,,that’s oil seeping out of the turbo housing. So now I have to do the whole job all over again,,,,we are now replacing the whole turbo and swapping over the updated engine oil feed line,,,I always hate doing the job twice,,,,but I guess it still pays,,,,it’s amazing how fast you can do a job the second time the next day. 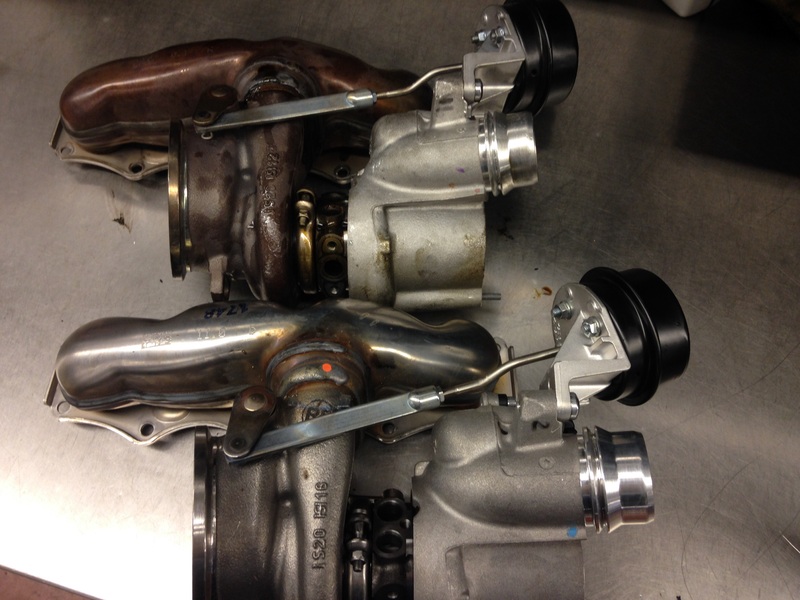 Heres the inside of the new turbo housing,,,,hopefully this fixes the problem. This entry was posted in Uncategorized and tagged N20, turbo, update. Bookmark the permalink. Hey- I think I might have a turbo issue on my N20. How do I actually get to the turbocharger since it’s under the engine. I haven’t found any resources online that show how to do it. Is there any way for me to buy the oil line with the valve check without going to the dealer and submitting the PUMA report? How much would it cost me to do it if it’s not possible? Also, how much would replacing the turbocharger completely cost? Is it possible to do it on your own? Any input would be greatly appreciated, this is very frustrating. Ok good news is you don’t need a puma case to get the updated oil line,,,,BMW finally released the oil line to the public,,,,you just have to order the updated oil line with a check valve,,,,I don’t know the price,,,,,but if a independent shop does it they should charge you about 5 to 6 hours for the job,,,,ok the bad news,,,,,for you doing it at home that’s not a easy thing,,,,,you have to be able to work from under the car and from the top of the car to get to all the nuts and bolts,,,you also have to support the engine,,,,because you have to remove the right side motor mount and bracket.,,,,I would never try and do this at home without a car lift. Thanks for the replies, man. I really do appreciate it. I’m looking into the warranty right now- I’ve still been doing a lot of additional research and I was wondering if there was a way to diagnose whether its a blown turbo seal or the oil feed line without taking out all the nuts and bolts? I’m not looking to replace them right now- just figure out which one it is. Also- while it probably isn’t good to drive with these issues, would normal usage of the vehicle cause catastrophic damage to the engine? As i understand the turbocharger is already carrying/passing super heated gas from the engine and I’d assume that it’s built to withstand tolerances that wouldn’t be affected by a little extra burning oil. What are your thought on the matter? Driving the car won’t cause anymore damage,,,,you should be just fine ,,,,except some burning oil during start up.,,,,there really isn’t any test to see if the problem the turbo or oil line or both. If you replace the turbo,,,you are going to replace and update that oil feed line anyway. Would this (newer oil line or turbo replacement) be covered under CPO warranty? Thanks. I sent you a PM on Bimmerfest, is there any chance you can take a look and get back to me? Hi bmwtechnician, My 2012 528i with 74K miles is now experiencing this problem during startup in the morning. Is there a way I can have BMW cover the cost of repair since it’s due to a defective inlet oil pipe and turbo. I’m sorry,,,,but no,,,,BMW won’t cover it due to your car is out of warranty. Thank you for the reply. I read on another forum that replacing the oil inlet pipe works but somehow, yours didn’t work. 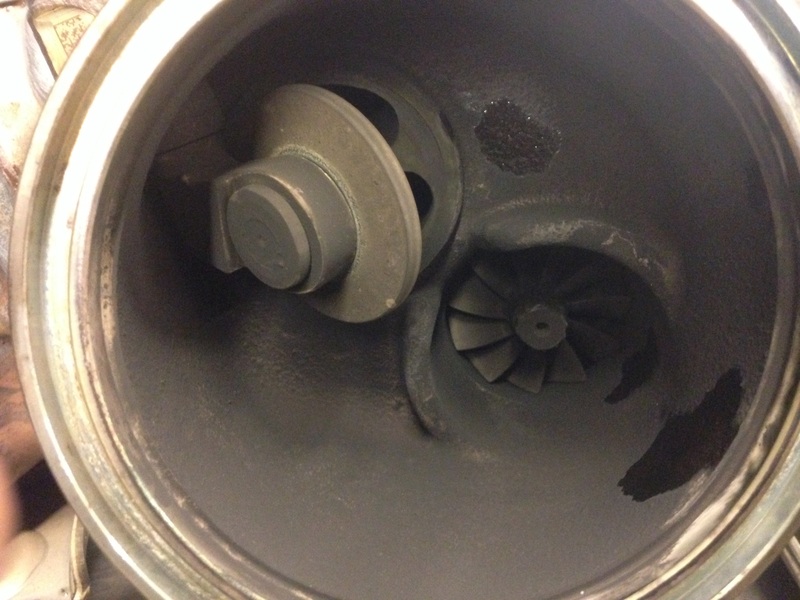 Do you really think that a turbo replacement is needed for this problem. I’m just looking for a cheapest way to repair this problem. Can you post the part number for the new inlet oil pipe that have the check valve. Thanks. Hi… just a thought… if the problem is just started… would parking the car with the passenger side slightly raised above the driver side help ( Tilted parkingO .. since all the oil will drip and rest on the driverside of the Sump ! No I don’t think that would help,,,,you can always give it try. I hadn’t driven my car for a few days while I was out of town. I fired her up this morning and I was engulfed in smoke! I called my SA and said if I can take a video of it and send it to him he will get the line ordered. He said if that doesn’t fix the issue I’ll be getting new turbo. Should I be concerned about anything if it comes down to that? How much did it smoke after you just replaced the line before BMW authorized the turbo replacement? Did that require a PUMA? I sent you another message on Bimmerfest. There’s no major concerns,,,,and no you don’t need a puma case to replace the turbo on a N20 engine anymore,,,,,because they know there is a problem with the turbo now. Are you saying the turbo will be replaced at no cost because it is a known issue? Even if the car is not under warranty. I am having this same problem 2012 528I. My car is no longer under warranty. I am told by another mechanic, this is a known issue. It is a known issue,,,BMW is thinking about extending the warranty on the turbos because of this problem,,,,they have not extended this warranty for the turbo at this time yet,,,,,hopefully it is soon. 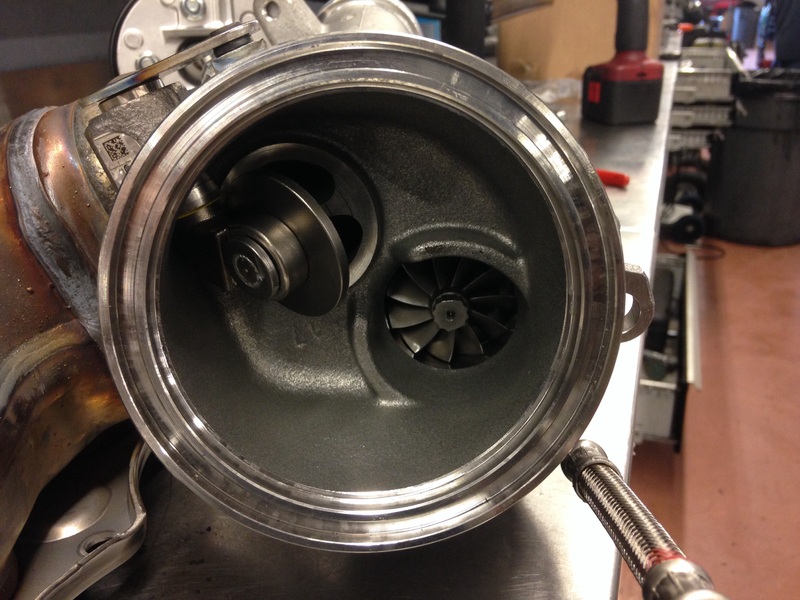 Do you have to remove the turbo to see traces of oil in the housing? Thanks for this post, it help me a lot to identify the problem and change the oil feed line with the correct part number (11428678840), the dealer want to give me this parts 11428626652 for my X1 2013, but I told them that I wanted the other number with the check valve. I removed the turbo myself and change the oil feed line and put a rebuilt kit in my turbo, after 15hrs of work and 240$ in parts (feedline, rebuilt kit, and gaskets), all is good now… Like you said, don’t try this at home if you don’t have a lift, this is not a easy job. Hi andreas question about the turbo oil feed line. If this doesn’t get fixed soon would it cause the turbo to fail in the future. Also how would you know if there is a problem with the turbocharger? It might cause further damage to the turbo if not replace soon,,,,you won’t know if it odd any damage to the turbo until you replace that turbo oil line,,,I have replace a lot of turbo oil line,,,,but I know of several one that have come back to replace the turbo a week later. I’m having a similar problem with tons of white smoke. It all began one day when my car started saying drive train malfunction, and it had limited acceleration. About a week later I took it to the dealer for servicing and to check out the problem. They told me that I had a blown turbo and that I would have to pay for it because I could present the receipts for the oil and oil change that I did myself. Long story short I took the car as is and drove for about another month and one day on the freeway there was a tremendous amount of white smoke behind me. The car seemed to keep stopping as I got off the freeway to pull over. But I never saw an overheat warning or anything on the display. Tow truck driver saw it all and swore I blew a head gasket, so he towed it home. The more I read, I wondered if it was a blown turbo seal. It’s a 2013 328i, 59,000 miles. Any advice would be great please. I checked the oil in the oil filter housing before and after running the car for a minute and no white creamy substance whatsoever in my oil. That’s a good sign that the oil color is ok,,,,,how was the coolant did that look ok,,,,if everything looks ok you might have blown the turbo seal,,,,it will cause the same thing a lot of smoke coming out the exhaust . The coolant looked fine too from what I could see. Is there a situation in which the car will keep trying to stop itself or shutdown over the turbo and smoking? Or would that only happen with an overheating situation? But I never smelled that traditional antifreeze overheat smell and I never saw anything on the display regarding water or overheating either. Yeah the white smoke comes out of the tailpipe immediately upon startup and looks to be coming from the right exhaust manifold section of the engine bay. Thanks for the response. I have a 2015 bmw 320i turbo that is doing this now. Is there a copy of the technical service bulletin that exist? I am in the process of getting my feed line replaced in my 2013 328xi and they called me up saying I should replace my turbo while they have it torn apart. At my expense. What should i do? just bought a car 2012 328i immaculate ,but I left it for 6 days and started it up to a massive smoke cloud of blue smoke ,looks like I have the same issue ,is the oil feed pipe a free recall ? I have a f30 328i from 2012. Since a month or so it produces smoke on a cold start. Strangely it only happens when my car is parked on my driveway with the front of the car up (my driveway is on a slope). Having the rear of the car higher than the front of the car it does not produce the smoke on a cold start. This free recall: is that only in North America? Or also in Europe? Thanks for all the interesting information on your blog! I only know about the American recalls,,,,you would have to go to your local dealer and let them do a key read print out and it will say what recalls or extended warranty is on your car. Thank you for your response! I really appreciate that! 2) on some mornings i have smoke coming from the rear. Now knowing i have had the turbo oil line recall done, how should i approach them about fixing the turbo ????? as that seems like the next step and it seems pretty common for X3 N20 engines ? I have taken a video this morning. The turbo oil line was updated as part of recall with previous owner. The car has done 57,000 miles and therefore now out of warranty, would bmw still fix turbo under warranty ? What test do they run to see if it is a turbo issue? Is it a quick check? Do you have the bulletin number they refer to when they first replace turbo oil line, and then the turbo if it not remedied? I have also read that cars are covered by 8 year 80000mile emissions warranty, which the car would fail burning all this oil, is this your understanding too? When replacing a turbo do you recommend and is it good practice to change the oil feed line to the turbo with the newer version (with check valve)? Also are there any other parts you would recommend changing with a new turbo above the standard turbo install / fitting kit and Oil / Filter change? Finally does the 320i (2012) have any banjo bolts your aware of relating to the turbo install or not applicable? Thanks for the reply. Does the turbo installation or fitting kit (part: 11652411444) include both the Oil Feed line and Oil return (drain pipe) ? Also is it recommended that all the coolant to the engine be changed with new coolant following a turbo install or not required? And would you advise a sump plug (with washer) to be changed with the oil change after turbo install ? No that part number is just for the turbo oil feed line,,, no need to replace the oil return hose unless it is leaking or damaged,,,,yes you will be changing the coolant when removing the turbo,,,no just replace the washer only on the drain plug. Hence it appears you would have to get the Oil feed line (with check valve) separately to the turbo install kit. OK thanks, if you had to retrospectively just install an Oil Feed line (with check valve) later on an already replaced turbo would it be just a case of taking that turbo out and installing that new Oil Feed line or what other parts that would need to also be replaced or renewed again (eg gaskets, etc) ?